Author: Hildegard Höftmann †. In collaboration with: Michel Ahohounkpanzon, Cécile Boko. Series edited by: Herrmann Jungraithmayr, Norbert Cyffer, Rainer Voßen. 6 pp. Roman, 431 pp. Fon – together with Ewe and Ge – is ascribed to Kwa, a sub-grouping of the Niger-Congo language family. Origin and distribution of Fon and its speakers centered in the former Kingdom of Dahomey, now part of the Republic of Benin. Because the Fon expanded significantly, their language now­adays is one of the major languages used in Benin, with 40 to 45% of the inhabitants speaking Fon either as a native, secondary or vehicular language. Outside of Benin, Fon is an important lingua franca in Westafrica and is spoken in Southwestern Nigeria, but also widespread in Côte d’Ivoire, Burkina Faso, Niger and Togo. In Southern Benin Fon is the major lingua franca, its speakers amount to about 1.7 million people. 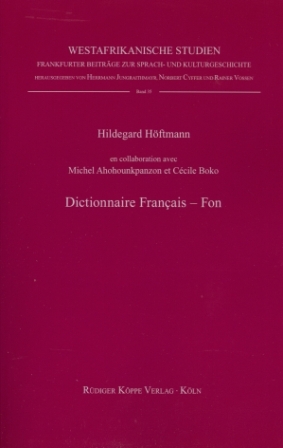 The present dictionary comprises approximately 5,000 entries, it appears subsequently to the Dictionnaire Fon–Français (2003) and – apart from the contained lexemes therein – it includes further headwords compiled from Fon-literature (journals, booklets/grey literature, official publications etc.) as well as from questionnaires sent to native speakers of the language. Furthermore, the corpus has been amended by modern technical terms from the subject areas of science, technology, medicine, botany, zoology, economics, as well as culture, politics and jurisprudence. The Dictionnaire Français–Fon is enriched by an appendix of tables which illustrate in a compact form important pronouns and prepositions as well as the numerals from Zero to 1 billion. Just as in her Dictionnaire Fon–Français (see link below), the author again uses the standard orthography of Fon with an additional representation of five different levels of tone (high, low and middle, falling and rising).